Much of the success of endodontic therapy is determined by the ability to remove pathogenic microorganisms from the root canal system. In most cases this can be accomplished through orthograde root canal therapy. When apical complexities that aren’t treatable from an occlusal approach harbor persisting microorganisms, they are often predictably treatable with a surgical approach. Second molars are often difficult to access surgically, which makes intentional extraction followed by root-end resection, retro-preparation, retrofill, and replantation a viable option. The case below illustrates this case type. Endodontic retreatment was performed due to Symptomatic Apical Periodontitis. Patency was not achievable due to ledging / transportation from the initial treatment. Consequently, sysmptoms persisted following retreatment due to bacteria remaining in the apical anatomy. 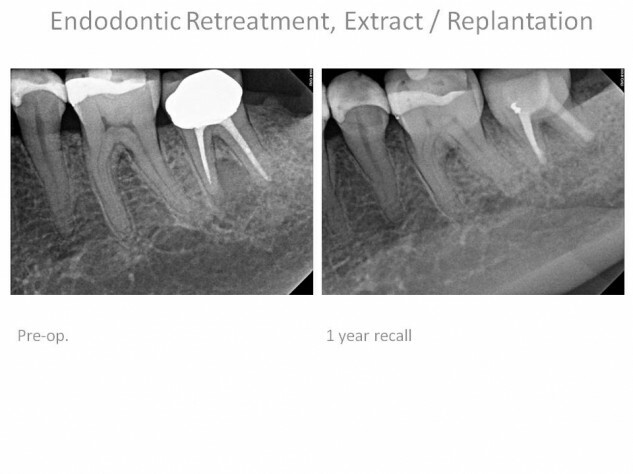 Rather than extracting the tooth and being left with an edentulous area or prosthetic implant, the root canal treatment was completed ex-vivo and the tooth was replanted back into it’s natural site. 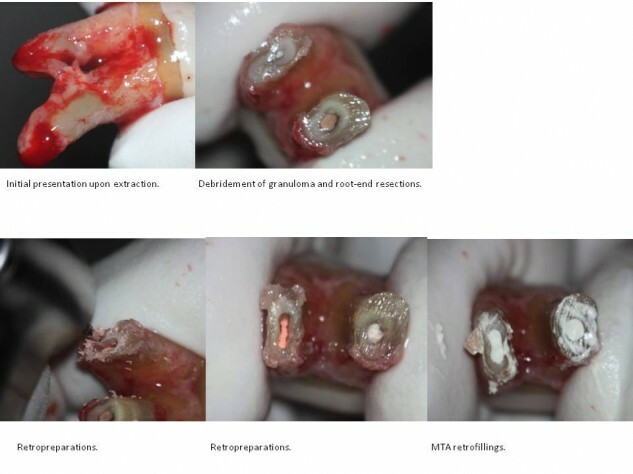 One year recall shows complete osseous regeneration of the Apical Periodontitis lesion. This tooth is free of symptoms, without mobility and is completely functional. The patient was extremely happy to be able to keep her natural tooth.